by Jonathan L. Howard Author · Jonathan L. Howard Author of introduction, etc. 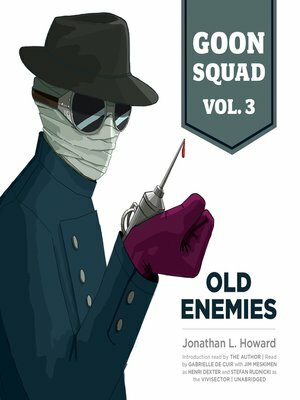 An ongoing, episodic "prose comic" from which the pictures are summoned by the magic of words, Goon Squad is set in a version of modern-day Manchester. Its biggest divergence from the real city is that it—along with most other large urban centers—has a team of superheroes to protect it against unusual threats with which the conventional forces of law and order would have problems.Goon Squad, Volume 3: Old Enemies is composed of: "Life during Wartime," "Red Wolf, Red Wolf, Does Whatever a Red Wolf Can," "Shadow of the Vivisector," "The Man from Switzerland," "The End of the Year Show," as well as an introduction read by the author.